In Days of the Week, Alex, Leah, their frog Hopkins, and host Rachel Coleman teach you signs for all the days of the week Plus, you'll have even more fun and signing practice through learning modules called Moving Time and Counting Time. Series Two can be used after the first 13 volumes of Signing Time are mastered, or can be purchased separately to supplement ASL vocabulary. Created for ages 1-8, yet fun for all. Available only on DVD. Close-Captioned. Approximate run time: 30 minutes, plus special features. Color, Not Rated. 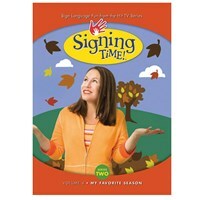 ASL signs taught in this DVD include: Day - Week - Sunday - Monday - Tuesday - Wednesday - Thursday - Friday - Saturday - Weekend - Again - First - Second - Third - Fourth - Sixth - Seventh. Special Features include: Sign Review - ASL Tips: More Signs - Deleted Scenes: Calendar - FAQ: Rachel's Color-Coded Fingers - Preview: Series One, The Zoo Train - Preview: Series Two, My Things.